Is Bishop Rock the smallest island in the world? Bishop Rock, also known as “Men an Eskob” in Cornish, is a rock emerging from the sea about 3 kilometers west of the Scilly Isles, off the western tip of Cornwall. 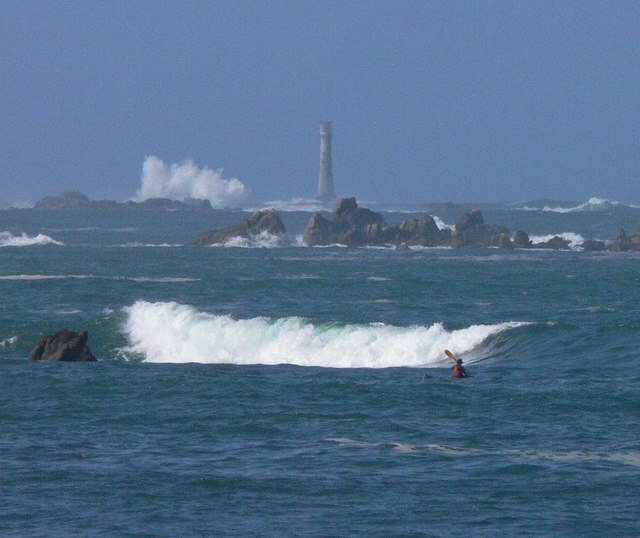 The only building on this rock is the eponymous lighthouse, the third built from 1858 to warn sailing ship about ht Western Rocks, that are a group of scattered rocks and uninhabited islands which caused many shipwrecks over the centuries . would have identified Bishop Rock as the smallest island in the world. This record would be based on an ancient British law of 1861 which would establish, for census purpouses, two minimum requirements to be called “island”: namely that was inhabitated, otherways which had enough room to ensure the «summer pasturage of at least one sheep». This latter condition would be met, according to the bureaucrats, by having an area of at least two acres. that is only 0,14 acres. This measure appears far more plausible of the two acres required by the alleged Victorian rule. It is also true that at that age time the value of Acre could change locally, but in 1861 the different units of measure in the United Kingdom had already been merged by force of the “Weights and Measures Act ” issued in 1824: the supposed rule would therefore have had to refer to acre as defined by British Imperial System. could not run into such a gross mistake: in fact it would be enough to give it a look to find out that the famous book there is no cluw of this supposed primacy. To take away all doubt we checked almost all the Italian editions from 1968 until today: in none of them does Bishop Rock appear and, being “world” records, the English editions should not be no means different. Moreover, Bishop Rock does not even appear in the online edition of the book. After verifying that the GWR does not confirm this statement, let’s go for checking the existence of a british standard according to wich a island must have enough room to ensure the summer grazing of a sheep. It is not necessary to go over all the archives of the United Kingdom with a fine tooth comb: the British government has indeed put online the majority of the legislative corpus produced since 1271 (including local regulations) on the site legislation.gov.uk. Well, even expanding your search to the nineteenth century and to the documents in the Welsh language, it seems to be no law, ordinance, regulation fixing the minimum size of an island in two acres. In itself this is not enough to state that it never existed (moreover, even the “Weight and Measures Acts” are listed on the site), but definitely does not confirm anything. It is also symptomatic that Trinity House, in the page dedicated to the history of the lighthouse in its official website, does not even mention the alleged primacy. Finally J. Calder, author of the website World Island Information entirely dedicated to the geography of the islands, get rid of this businnes reporting it as an «unwarranted claim». «an old bureaucratic regulation fixed in two acres the minimum area of an island». «Bishop Rock has an area of two acres». False, we can say with reasonable certainty that the GWR never referred to Bishop Rock. , so much so that no one will care to check. What then is the smallest island in the world? It is impossible to determine an actual “world’s smallest island”, as there is not an unambiguous definition of “minimal island”, below which we would call it a rock. In addition, there may be hundreds or thousands of islets of similar characteristics, without counting the difficulty of precisely defining the area of a small, uneven surface often subject to tides. What is certain is that there are definitely inhabited islands much smaller than the Bishop Rock (which is also uninhabited) For example, near Noank (Connecticut) there is an island called “Mouse Island” (or “Muse Island”) that is of 1,5 acres on wich there are three residential houses; not far away, at the mouth of the river Thames (the american one) there is another one known Hobs Island, sized just half an acre, whit a single house. 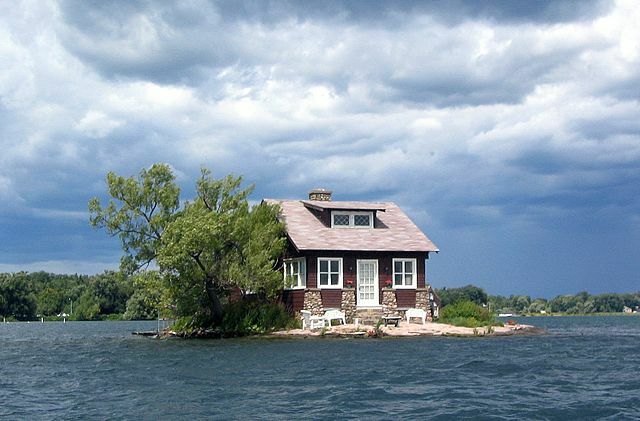 An islet meaningfully called Just Room Enough, in the Thousand Islands archipelago along the Lawrence River (on the border between Canada and the US) has an area of ​​just over 500 m² and above it there is a small house. The islet called “Just Enough Room”, on the Lawrence River between Stati Uniti and Canada. Thumbnail image: “Bishop Rock from Periglis Bay”, © J. Davey [CC-BY-SA-2.0], via Geograph. Originally published in Italian 3th Mar, 2013.